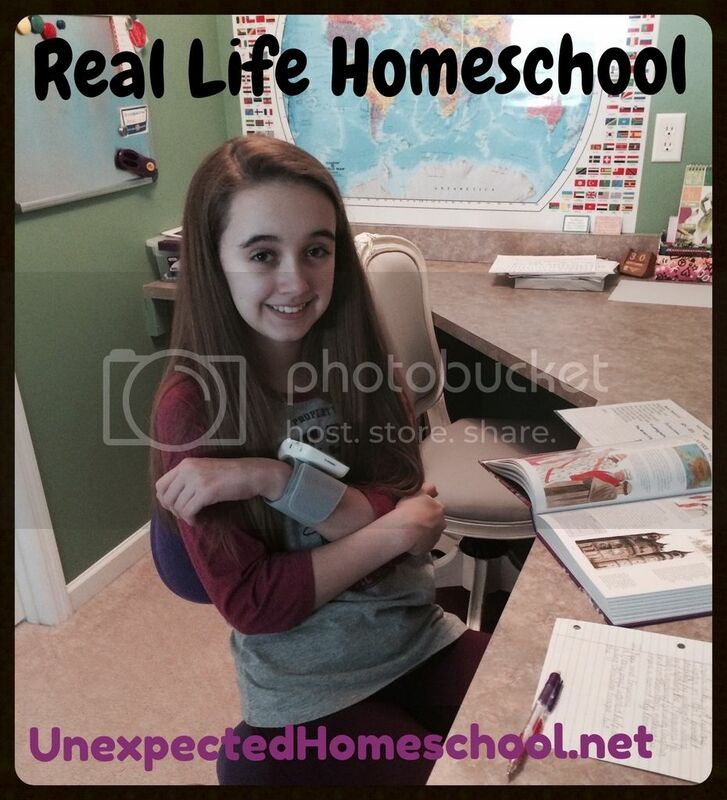 We're back for day two of 5 Days of Real Life Homeschool. Yesterday I described one of Amber's crash days. Today it's a medical appointment of which we usually have at least one that disrupts every week. We are up earlier than normal for both of us (7:00am!!!). Amber's appointment with the neurologist that treats her Dysautonomia is at 10 am nearly an hour away from home (with time for Amber to walk the parking lot). I get Amber going with medications and then let her wait for them to take effect while I shower. Then she is up showering. Amber decides on another wet pony tail so we can leave earlier. It's raining and that always adds time to our drive. About a third of the way through the drive we swing through the Chick-Fil-A drive-thru for our traditional doctor visit breakfast of scrambled eggs and hash browns. Amber can only eat breakfast at Chick-Fil-A as their other foods all contain ingredients she cannot digest. 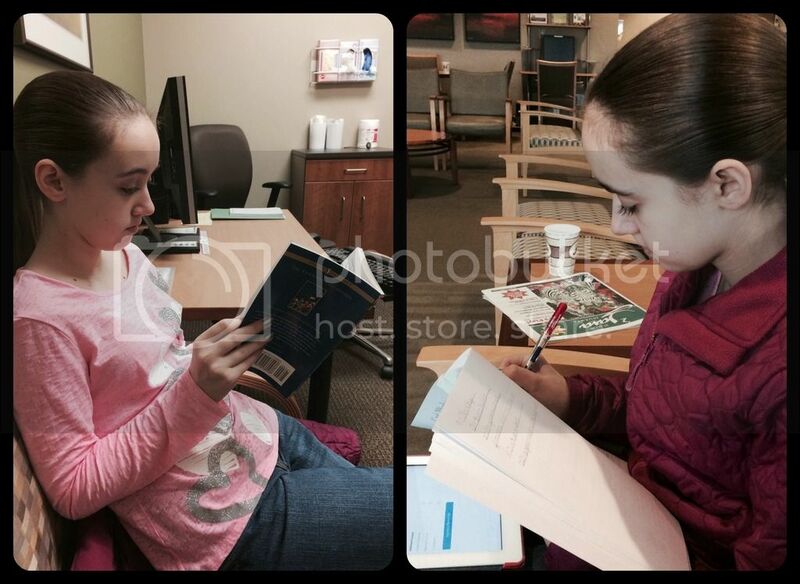 Amber has taken school assignments for the car ride and the waiting room. She worked on her Greek Morphemes until we picked up breakfast. After arriving at the neurologist's office we sit and prepare for the endless wait. This particular doctor is never on time. Ever. We were about 20 minutes early today, but the front desk staff is so slow that it takes them that long to check a person in. Amber finishes her Morphemes lesson in the waiting room and continues her Canterbury Tales reading for literature. I'm just goofing off on my phone because I'm seriously anxious about the discussion we need to have with the doctor. Amazingly, we are called back to the exam room only 20 minutes after Amber's appointment time. They do basic autonomic testing at every visit, so this means we still won't see the doctor for another 30 minutes, but it's progress. At 11:15 am we are leaving the office with updated medications for Amber and a recommended referral to the Mayo Pediatric Autonomic Dysfunction Clinic. All my worry was for naught and the appointment went well. Amber also completely finished reading The Canterbury Tales. We call my mom and plan to meet her for lunch at a Red Robin, not the one by our house but back in the same area as the morning Chick-Fil-A. 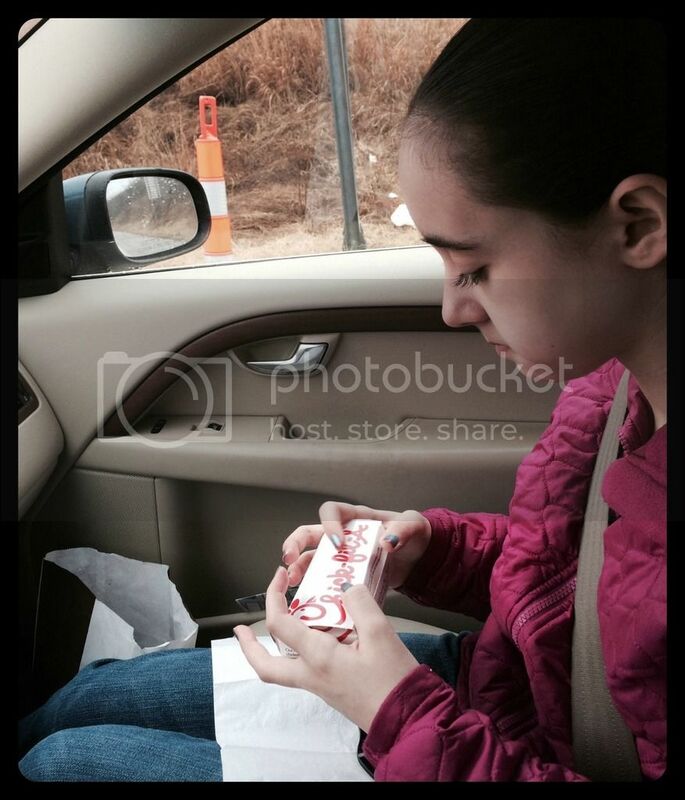 Amber is absolutely exhausted so she rests during the car ride and is fairly subdued during lunch. By 1:15 we are on our way home. It's still the same drive as the way to the doctor, but broken into segments it doesn't seem as bad. Amber is feeling a lot better with lunch of a plain burger patty and allergy fries in her stomach. She also isn't as nauseous as the day before. Once home Amber decides she can complete more school lessons after a brief rest. I prepare Amber's history writing assignments for her and let her choose between a new math lesson or the math test that should be scheduled that day. She chooses to take the math test, so I get that copied. While Amber is working on her assignments, I vacuum the house, tidy up after the cats, start the remainder of the laundry, check into the details for a call to the Mayo Clinic (I'm not quite up for that call right then), and read the book for Amber's brand new sewing machine. Around 3:30 Amber has finished her school work and I call it good for the day. She wants her Jamberry nail wraps taken off because she's tired of this pattern. It's also time for her afternoon snack before practicing flute. It's been a very long day for her and I'm proud that she has accomplished so much. While Amber practices flute I review resources for eighth grade and plan what we might do for history. I really want to get the entire Homeschool in the Woods American History set, but not sure if it will be overkill with Tapestry of Grace. Additionally, some of the Homeschool in the Woods topics we won't cover until ninth grade, so will we still use it? Amber enjoyed the TOG and HSITW mixture this school year, yet I'm on the fence about the future. 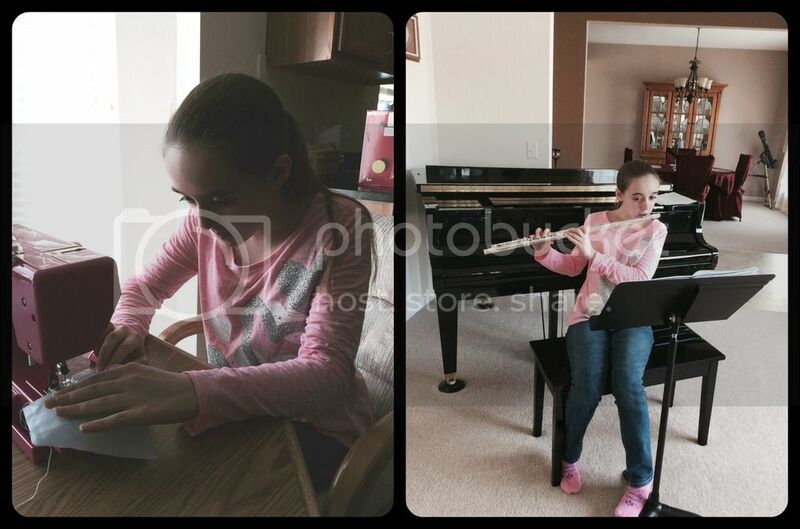 Amber finishes flute and is ready for sewing with her brand new pink sewing machine. She's only ever used mine in short bursts, but wants to try her hand at sewing on her own. She works from about 4:30 to 5:45pm practicing with the machine and working on her first Barbie doll skirt. Sewing and flute. A rather good end to the afternoon. We then meet Fred for dinner at a local restaurant that is safe for Amber. I was too exhausted physically and mentally to contemplate a nutritious dinner that Amber can eat. This has been a theme lately. I think I'm a little stressed. After arriving home from dinner Amber watches TV and iMessages with her friend again. I sit downstairs with Amber and research more about the Mayo Clinic and begin plans for a trip to Rochester, MN. Bedtime comes and Amber gets ready and is in bed by 10:15 again. I play on my iPad in bed for a while too before falling asleep after midnight. It was a long day for everyone, but much more productive than Monday despite the neurology appointment. Stay tuned for my Wednesday installment of 5 Days of Real Life Homeschool. Wow, you guys keep busy. Glad the appointment went better than you thought it would.